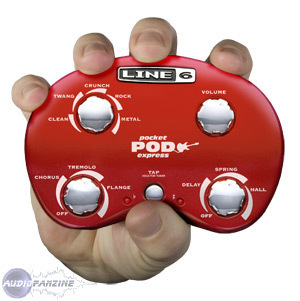 Pocket POD Express, Portable Guitar Amp Simulator from Line 6 in the POD Bean series. 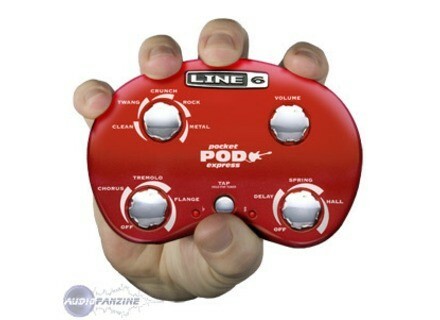 Pocket POD Express delivers guitar tones without the need for an amplifier. It features five historic tones, ranging from cleans to high-gain distortions, modeled after* sought-after amplifiers including Fender® Deluxe Reverb®, Vox® AC30 Top Boost, Marshall® JCM 800, Mesa/Boogie® Dual Rectifier® and Fender® Twin Reverb®. And, including Chorus, Tremolo, Flange, Delay, Spring Reverb and Hall Reverb, Pocket POD Express features six guitar effects. It offers a built-in tuner, a 1/4-inch input and output, a 1/8-inch headphone output and a 1/8-inch MP3 input for jamming along or practicing with your favorite songs. Pocket POD Express can be taken anywhere because it is battery powered and can be clipped to your belt or guitar strap. Pocket POD Express is powered by four AAA batteries (included) or DC-1 power supply (optional). Hang'em High Acoustic Guitar Hanger Hang'Em High Guitar Hangers presents the Model 6, a guitar hanger designed for acoustic guitars. Kaces GRAFIX Mexican Flag Electric Guitar Case Mexico seems to be a fashionable destination these days, and i know what i'm talking about! If you agree then check out this case, it might just be THE one for you! Fender Introduces New Y. Malmsteen Model Fender has announced a new Stratocaster model dedicated to Yngwie Malmsteen, this time in the brand's "Tribute" series.